Who else loves to spend time before Christmas up to your elbows in flour? If so, this one's for you! It's my collection of practical Christmas cookie-baking tips, packed with ideas for new and experienced bakers both. PS Facebook & Pinterest users, if you love Kitchen Parade, be sure to "like" and "pin" this page! More and more, search engines and even real-live human beings rely on social media indicators to identify the best sources of trusted information. What’s your style? Some prefer a flurry of baking, all in one day. Me, I’m slow and steady, one batch a day for a week or more. SLOW & STEADY – The first night, I mix two batches of cookies but bake only one. The next night, I mix a third batch but bake the second batch. This way, I spend maybe one to two hours a night, no cookie-baking marathons for me. BAKING BONANZA – For anyone who wants to do all the holiday baking all in a single day, consider mixing the cookie doughs ahead of time (at least those that need chilling, so many do) but then baking and packaging on a single day. OLD FAVORITES – Fancy cookies are one thing. But what people really love are the old favorites. One year, my friend Ann brought rice krispy bars to my cookie swap. They were so festive with a little red and green food coloring, also a few M&Ms slipped in. I thought the kids would love them – but the grown-ups did too! My favorite old-time cookie recipes are Molasses Cookies, Cinnamon Sugar Cookies and Oatmeal Raisin Cookies. ONE STICK PER BATCH – To go for variety, versus quantity, choose recipes based on a single stick of butter. If the recipe calls for more, cut it in half. The one exception is shortbread – shortbread has such a high proportion of butter, use a recipe that calls for a cup of butter, that’s two sticks. HEALTHY COOKIES – Forget ‘healthy’ cookies! 100% whole wheat flour hardly matters when paired with butter and sugar. Unless you’ve got a recipe that you know people love, just go for it. BITE-SIZE COOKIES – But do consider making small cookies. I make cookies that are only two or three bites big. That lets my favorite cookie monsters eat two or three or even five at a time, the equivalent of one or two large cookies. MIX IT UP – Mix flavors, colors, shapes and textures when choosing the cookie recipes. You don’t want all chocolate cookies any more than all round shapes, all nut-based cookies any more than all iced cookies, all butter cookies more than all meringue cookies. INSTANT COLOR – One way to easily add instant color to a cookie plate? Dip moist dried apricots into melted bittersweet chocolate, let cool on waxed paper. COLORED COOKIES – For color, I swear by red and green M&Ms in my friend Kathy's Perfect M&M Cookies (pictured below in the back). The dough itself is dyed for Colored Roll-Out Sugar Cookies (pictured below in the center as "Christmas Stars" with silver dragées). Fresh Cranberry Drop Cookies are made with fresh cranberries, very pretty, and Cranberry-Mac Morsels are made with macadamia-nut butter and colorful dried cranberries. Okay, okaaaay. You’ve heard it before here, I know. 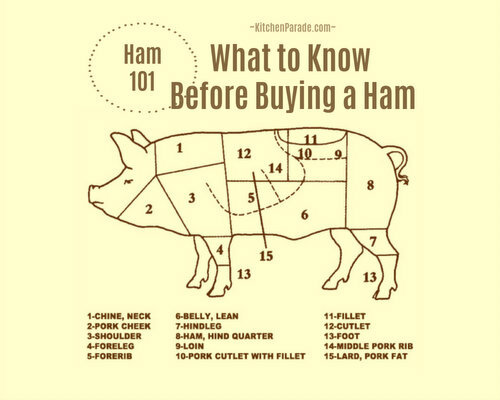 But “make soup” is the first step before a big baking or cooking project. That way, there’ll be something to eat when you’re done and the last thing you can imagine is cooking dinner. That way, if you sample the cookie dough along the way, you’ll have a healthy dinner waiting as antidote. This week I remade this Turkey Sweet Potato Soup: what a winner! GET ORGANIZED – Make your baking list, noting names and cookbook page numbers. If you’re baking recipes from online sources, print out the recipes. Read through each recipe, noting special equipment, whether the dough needs chilling, baking temperatures, etc. Make a grocery list; I make my list by cookie so that if I decide later to skip an entire batch, it’s easy to skip the groceries, too. BUTTER – Look for butter on sale throughout the holiday season, there’s just no reason to pay full price. Watch for great value in unusual places. One year, the best price for my favorite Land O’ Lakes butter was at Target. If you end up not using it all for cookies, butter freezes beautifully. So many recipes call for unsalted flour so that the baker can control the amount of salt to add – but to my taste, we bakers never add enough salt. So especially for old-fashioned classic recipes, I nearly always always-always start with salted butter. BUTTER vs MARGARINE – I’m an all-butter all-the-time kinda girl but this year learned the fascinating tip that 50:50 butter:margarine makes for those thick almost-square edges we see in many bakery cookies. FLOUR – If your flour is more than a couple of months old, invest in fresh flour. It makes a tremendous difference. My number one tip for excellent cookies? Fluff the flour to aerate it before measuring – you’ll use up to 25% less flour in weight and your cookies will be ever so much more tender and light. The exception here is if your recipe always lists flour by weight. SHORTENING – If any cookie recipes call for Crisco and you’ve got an old tub hanging around, smell it – you’ll likely want to get fresh shortening. I used to buy the big tub, now, never. SPICES – Look for great sale prices on spices before the holidays. Take inventory and refresh all the herbs and spices that are running low. VANILLA – Some people swear by the highest-quality vanilla, every time, every cookie. My own take is that high-quality vanilla is important when vanilla is the most significant flavor – vanilla ice cream, say, or homemade custard. But once it’s mixed with spices and fruit and chocolate, it matters less. CHOCOLATE – I like to use the mini chocolate chips, you can use fewer because they distribute more widely. NUTS & DRIED FRUITS – Trader Joe’s has by far the best price on nuts and dried fruit, including pre-toasted pecans, walnuts and almonds, a time-saver at no additional cost. Even if a recipe doesn’t call for it, do toast your nuts ahead of time (except black walnuts), the nutty flavors just really deepen. NEW LEAVENING – Baking powder and baking soda lose their oomph. Unless you’re a regular baker or happen to have new containers, invest in new ones. PAPER SUPPLIES – Check to see what’s on hand, parchment paper (for baking), paper towels (for cooling cookies on open counters), waxed paper (for separating layers of cookies in storage containers), aluminum foil and plastic wrap (for wrapping doughs and gift plates). I especially love the Christmas-y plastic wraps sold this time of year. MIXERS – If a standing mixer is on your Christmas wish list, maybe Santa would offer early delivery? But a hand mixer works just fine – I used a $9.99 model for 20 years before inheriting my mother’s vintage-gold Kitchen Aid. I still turn to it more often than not. COOKIE SHEETS – Cookie sheets, who knew they performed so differently? I wish I could recommend my very favorite cookie sheet – because I wish I knew how to buy several more for myself. Since losing one a few years back, I’ve bought a half dozen cookie sheets, some inexpensive, some expensive. None perform as well and worse, they all perform differently. So I’ve taken to testing cookies on my one remaining ‘good’ cookie sheet plus on parchment and on silicone mats. PARCHMENT vs SILICONE – I’ve learned to prefer parchment, for the bottoms of the cookies turn slightly crispy and golden. With silicone mats, the cookies bake fine but the texture just seems off to me. A good cut-out cookie recipe is worth hanging onto! I have yet to find my own perfect recipe for cut-out sugar cookies, in part because I so love my year-round recipe for Cut-Out Spice Cookies adapted from my very first cut-out cookie, Frosty Christmas Trees. But – later this month, I'm going to share a no-roll, no-fuss butter cookie that tastes like the very best sugar cookie you've ever eaten but without all the work! It's pretty, too! POWDERED SUGAR, NOT FLOUR – Before rolling out the dough, sprinkle your work surface with powdered sugar, not flour. The sugar will melt into the surface. CHILL OUT – Roll-out cookie dough is usually easiest to handle after it’s chilled all the way through so allow an overnight of chilling. If you’re short on time, break the dough into three or four disks about an inch thick, these will chill faster. BUMP UP THE FLAVOR – Make sure your cookies taste like more than sugar, flour and butter by adding vanilla than usually called for. But vanilla may be too subtle, I almost always substitute lemon extract for vanilla, at Christmas some times I choose peppermint extract. ONE TRAY AT A TIME – Don’t get ahead of yourself. A tray of cut-out cookies should sit out for only a few minutes before going into the oven. Otherwise the dough gets too soft and the cookies lose their shape. You can put them into the fridge to chill but that changes the temperature too. GENTLE, GENTLE – Roll out the dough as few times as possible. The more the dough is rolled and handled, the tougher those cookies will get. So roll out all the dough once, collecting the scraps on the side. Then gather together the scraps into a dense ball, form into a flat disk and refrigerate until ready to roll out again. At Christmas, it just seems right to "dress up" cookies just a little. One favorite pecan cookie has a smear of icing that holds a pecan half; a mocha square has a zigzag of icing with a chocolate-covered coffee bean. Need inspiration? Just search for "Christmas cookie" on Pinterest or "Christmas cookie" on Tastespotting! DECORATING SUGARS – Too often, these just fade into the cookies so these days, I only use red and green colored sugars. SPRINKLES – So vibrant, so pretty! I love sprinkles! COLORED ICING – If you are going to use different colored icings, count on lots of waste. Double or triple the icing recipe so there will be enough. My favorite icing comes from Cut-Out Spice Cookies. For a small batch, mix 3/4 cup powdered sugar with 1/2 teaspoon extract (see below) and 2 tablespoons water. A few drops at a time, add more water to thin a little but be careful, it should be pretty thick so that it doesn't just wash all over the cookies. FLAVOR! – Don't forget to put an extract or something into the icing, otherwise it's just sugar. Vanilla, almond, lemon, peppermint, anise, coffee, they all work! FOOD COLORING – Gel dyes create more vibrant frosting, liquid dyes are less expensive, however. Add just a little dye at a time, start with light green, then add more for medium green, still more for dark green. I like to dye two or three shades of the same color. For contrast, make a full batch of white icing. REALLY REALLY WHITE ICING For extra-white icing, pick up a bottle of this Wilton product called Icing Color White-White. It works on icing that has been dulled by vanilla, say. It also works in buttercream that is tinted yellow from the butter. It also works beautifully to make a lighter tint of an brightly colored icing, very pretty! FREEZER BAGS – Freezer bags make great frosting dispensers, just snip a corner; start small and make it bigger as needed. When working with several colors at once, put small plates in the middle of the work surface, one bag per plate. 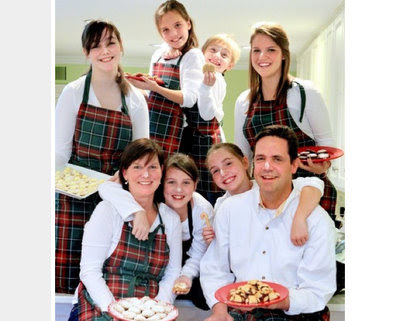 PICK ONE COOKIE, BAKE IT WITH DAD – Here's the Judd family tradition: each child (there are six!) picks a cookie and then bakes it with their dad. I was so taken with this tradition when I was interviewing Pat Judd from The Daily Bread Bakery & Cafe in Des Peres for my own column in the Post-Dispatch that I shared it with my editor. She loved it too – and the Judds are this week's very fun cover story! Here's the story, recipes too, eight of them, one for each kid and mom and dad too! Don't forget Pat's great list of cookie-baking tips, I've learned several new things from this long-time baker! FLOUR YOUR NOSE! aka HAVE FUN! – If you look really closely at the family photo of the Judds below, you'll see flour on everyone's noses! Pat told me that this tradition started with his mother and daughter Annie. Love it! COOKIE PARTY! – In my family, anyone is allowed, at any time during the day to call out, "Cookie Party!" That's the signal to set the table with pretty paper Christmas plates and napkins and to put together a plate of cookies. And then we sit down and eat – cookies, just cookies. Well, and drink milk or tea. DROP IN & DECORATE – My friend Lydia has the biggest heart. Any surprise that she founded the great non-profit, Drop In & Decorate? It helps people host cookie-decorating parties for charity. It’s a fun afternoon's project, one year my cookie swap guests decorated cookies for a church in downtown St. Louis which makes lunch for homeless people. It's not too late to host your own party, Lydia has all the tools and tips to make it easy as apple pie, I mean, cookies! Trust me, after baking so many cookies, you really do want to give them away! I'm no expert on packaging, I arrange them on a metal Christmas plate, the ones you get for $.50 at the grocery store in after-Christmas sales. Fancy, eh? So I'm going to refer you to My Kitchen Addiction, who's really good at this stuff. Me, I'm learning! STORING COOKIES FOR HOME – I have a collection of cookie tins collected over the years, some small, some large. But use what you have, even heavy clean boxes (smaller and shallower work best) from an office supply store. It's best to store just one kind per container. To protect the cookies, put a layer of waxed paper between every layer. Label the container! MAILING CHRISTMAS COOKIES – One year, my sister mailed a huge box of homemade Christmas cookies to our dad via the post office. What a mistake – they arrived some time in April. You just don't know how disappointed he was. It pays to be able to track the cookies, whether via the post office or UPS or FedEx. Yes, this one's going to be hard but when Christmas is over, throw any leftover cookies away. Away. AWAY! I tell you. Yes, they'll freeze. Yes, you can keep them if you have the willpower of a dog on the hunt. But I don't. I can freeze cookies for weeks and have no interest in them and then all of a sudden, bam, it hits me and they're calling to me from the basement, "Hey Alanna, we're down here and so yummy!" My sister tried to tell me this, unfortunately, I learned the hard way. So my advice, yes, is to throw them away. You know how some of us like chewy cookies and others of us like crispy cookies? Well those are just two of the textures that Chewy Gooey Crispy Crunchy Melt-in-Your-Mouth Cookies author Alice Medrich organized her book around. Last year, it won several awards, including Best Book for Baking from IACP and Best of the Best from Food and Wine. I've been pouring through her cookbook and at least two recipes will reach my own cookie plate this year. I think you'll like it! THREE WAYS TO ENTER – Comment here, sign up for free e-mail subscriptions, tweet on Twitter or share on Facebook. IMPORTANT! For a valid entry, you must leave your e-mail address too, so that I can notify you if, I mean when! you win. You are welcome to disguise your e-mail address so that I can read it but the automated address collectors cannot, something like, cookie hyphen baker at lovechristmas dot dot com. THE FINE PRINT This giveaway is open to all U.S., Canadian (hello, Canadian readers!) and worldwide readers. All entries must be received by midnight CST on Thursday, December 8, 2011. Winners will be chosen by Random.org and notified via valid email address. If I don't hear back from the winner within 48 hours, I will select another and try again. My copy of the cookbook was given to me by the publisher Artisan Books but the giveaway idea and the shipping costs are my own. Kitchen Parade is written by second-generation food columnist and Christmas cookie lover Alanna Kellogg and features fresh, seasonal dishes for every-day healthful eating and occasional indulgences. Do you have a favorite Christmas cookie recipe that other Kitchen Parade readers might like? Just send me a quick e-mail via recipes@kitchen-parade.com. Never miss a recipe! If you like this recipe, sign up for a free e-mail subscription. If you like Kitchen Parade, you're sure to like my food blog about vegetable recipes, too, A Veggie Venture. Follow Kitchen Parade on Facebook! Great post! I particularly appreciated the butter/margarine tip and the "you don't have to use the super expensive vanilla" tip! Great post! I always freeze butter - Crisco too. This is the most extensive list of tips I've seen. (Appreciate the giveaway but I'm not the giveaway sort, so please don't enter me!) Anyway, thanks for a wonderful post. I have two favorite traditions...one old, one new. The old favorite was making cookies with my mom a few weeks in advance of Christmas. We made so many, we had to have the extra time. Then we stored them in huge glass jars in the cold of the garage. My favorite was the Hungarian Horns...rolled crisp pastry crescents filled with a chewy nut meringue. I was going to renew that tradition this year with my sister, but can't find the recipe anywhere. But I'm going to keep looking and will share it with you when it reappears. My newest tradition (although this one is years in the making too) is that ever popular cookie exchange with my girlfriends. In the last two years we've upgraded it to a cocktail dinner/cookie exchange and it gets better every year. Now not only do we get a plate of cookies to take home, but also new dishes to try that we each bring to the dinner. Now I'm going to search through your cookie recipes to see if I'd like to change my cookie exchange choice for this year. My favorite holiday cookie tradition is all in the baking. I make over 300 dozen for family and friends and love every minute of it! My favorite Christmas/holiday cookie tradition is.....baking gingerbread cookies for family, friends and co-workers. It is always a challenge because I am also heavily involved in Nutcracker productions but it is so worth it! My favorite tradition - lots of kinds of cookies! My grandmother used to make tons and give everyone a box. My favorite were the ones with ground brazil nuts - you knew you were getting big and strong when you were strong enough to help grind the brazil nuts with a hand cranked meat grinder (no food processors then!). Now I benefit from my church's "cookie walk" - held as a fund raiser, but it allows me to buy cookies I won't bother to make myself (anything too fussy!). My favorite christmas baking tradition is making baklava! I only do it once a year because it's very time intensive, and calorie intensive! They are extra special! I have so many favorite baking traditions that I can't pick just one and have trouble remembering them all! I love making and decorating cut-out cookies with my sons, my Mom and my sister and her son. I love making cinnamon rolls and Russian twist bread for Christmas morning and to give as gifts. I am making macarons from the book Les Petits Macarons for teacher gifts. 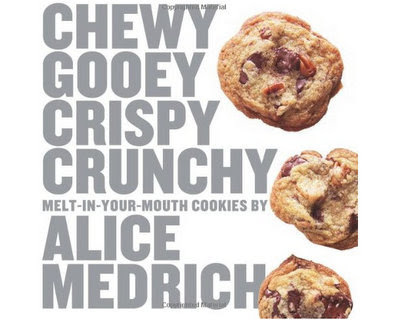 Love baking, and love Alice Medrich's book too. Thanks! Baking enthusiast at lilyfarmer@aol.com. happy holidays. When my children were growing up we lived in Egypt, and I started the tradition of using camel-shaped cookie cutters to make gingerbread camels instead of other figures. I still make a couple of batches and decorate them with frosting saddles. Thanks for all your cookie tips. I make 20 kinds of cookies most Christmas seasons, and have found my smallest cookie dough scoop (1 1/2 tsp size) to be my most valuable tool for uniform cookies. Uniform cookies look better on the plate and bake evenly on the pan. Thanks for the tips. With over 40 years of baking cookies, usually at least 20 kinds to give as gifts, I've found that a 1 1/2 tsp cookie dough scoop to be my most valuable tool. Identically-sized cookies bake more evenly and look prettier on the plate. Thanks for the tips. My favorite Christmas/holiday cookie tradition is one we are beginning tomorrow morning. Two sisters-in-law, a niece, an aunt and I are gathering with ingredients in tow to bake/decorate/enjoy Christmas cookies together. Your tips are timely and most appreciated. Can't wait to see what we manage to bake up. I just shared your Holiday Cookie Baking Tips on my Facebook page. When I shared your Pumpkin recipe ideas this fall my friends loved it! Thanks for all your great recipes and tips I have followed your food blogs for over a year now and my family always enjoys the recipes. My favorite holiday cookie tradition is unexpectantly receiving wonderful homemade cookies from a friend. There are those from whom I always receive delicious cookies and we thoroughly enjoy those. Bur surprise cookie platters and tins are always extra special and are enjoyed immensely. The other wonderful part of the cookie baking tradition is the wonderful way the kitchen smells during and after the process, and sneaking tastes of the unbaked cookies & the still worm cookies from the oven. I used to bake a lot of cookies and other wonderful goodies at Christmas time when my children were little. Now I've really cut back on what I bake. Your blog, which I love, has inspired me to get back into the kitchen and bake cookies for everyone!!!!!! Thanks. The cookies I remember most from my childhood are snowballs. Pecan shortbread balls rolled in powdered sugar. My kids love to make cookies with a press, so I'll be doing those this year. Thanks for the tip of using the butter/margarine mix! With a name like that how could this book be anything but amazing. Cookies will be everywhere when this book hits the kitchens across the country. My favorite holiday cookie tradition is sitting back in the evening, weeks before Christmas, and reading all my Holiday cookie recipes. i love the process of choosing which recipes to try and which stand byes will be the first to bake. Of course, I always pull aside too many recipes and so then I have to spend a night making the final decision of which ones get made. I love Christmas! My favorite holiday tradition is baking! I was just looking for some new recipes. Thank you for the post! I do follow you on email. My favourite Christmas cookie tradition is the ones my grandmother taught my mother who in turn taught me. Pfefferneusse, Lebkuchen, and Springerle are still my favourites. No matter what new and delightful cookies there are, it doesn't feel quite like Christmas without all the old favourites. Great tips! I thought I baked a lot of cookies, but you have me beat for sure! I love your emails and we will be making many cookies to give away this year. The cookie book would be a nice addition. my favorite is snickerdoodles,a close second is 'anything' with ginger, but the boys only want chocolate chip, but ones that snap not bend. my friends and co workers look forward to my batch of lemon biscotti, again one that snaps-no oil or butter in them. My favorite Christmas cookie tradition is to bag brown sugar nut bars and put them under the Christmas Tree for all of the children at our Church Christmas party. my favorite holiday tradition is sufganiyot - jelly or cream filled donuts. I just got a deep fryer and may be trying my hand at this this year. I love all your cookie tips and will be baking up a storm this weekend with my grandchildren! just tweeted about this site and giveaway to my limited following. There are a lot of comments here. I don't really have anything original to say except that I am a terrible cookie maker. My husband is much better. The cookbook sounds as if maybe even I could learn to make marvelous cookies. My favorite holiday cookie tradition is putting together the tin of cookies each member of my husband's family receives at Christmas. We reuse the tins every year & we all love it! I'm always looking for new recipes to add to the rotating assortment! My favorite tradition is waiting for my daughter to come home and then baking gingerbread cookies with all of my children! I'm a subscriber to Veggie Venture! Russian Tea Balls - The kids are in their twenties now and still have to have the snowball cookies :-) Thanks for sharing so many wonderful recipes! Does Allana have modifications for high altitude in the book? My favorite Christmas/holiday cookie tradition is..baking! Cookies, pies, breads always making something for everyone, especially when its cold out! My favorite Christmas/holiday cookie tradition is ... leaving platefuls of cookie medleys for neighbors! My favorite Christmas/holiday cookie tradition is ... Trader Joes Jo Jo's, not homemade but still delicious! Thanks for the entry...could really use that cookbook. Nothing says Christmas to me like the Russian Teacakes my grandmother made, rolled twice in powdered sugar to get them right (once when hot and once again when cool). I'm already an email subscriber. Our family makes monster cookies! We make candy and cookies evry year. Throwing them away would be so hard! I usually just keep giving them away until they're all gone. they were cooling on the kitchen table,we were busy making more cookies. We heard a loud noise. Our dog Candy ate the first batch that year. Yes, I want to play. I have made a Chocolate, cranberry and ginger cookies this year that got rave reviews from adult eaters. I used white unbleached whole wheat flour and wheat bran, plus some egg-whites, so this sounds really healthy - just don't over do the quantity, which is tempting. Preparation: makes 24 silver dollar size cookies. 2. Whisk flour, wheat germ, baking soda, salt and ground ginger in a small bowl. Whisk egg, brown sugar, oil and vanilla in a large bowl. Add the dry ingredients to the wet ingredients; stir to combine. Add oats, chocolate, blueberries and crystallized ginger; stir just to combine and add egg whites if needed to moisten everything, but do not make it too wet to handle. Drop by rounded tablespoonfuls onto 2 un-greased baking sheets, 1 1/2 inches apart. 3. Bake the cookies until puffed and barely golden around the edges, switching the pans back to front and top to bottom halfway through, 8 to 10 minutes. Cool on the pans for 2 minutes; transfer to a wire rack to cool completely. my favourite tradition is making Monster Cookies, a cookie recipe that makes hundreds of cookies! My best friend and I spend hours baking and laughing together. I look forward to Christmas baking every year! Hurray for having another delicious recipe to bake! 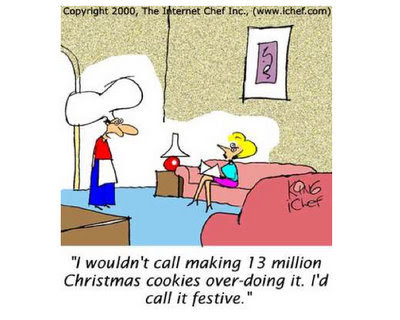 I love baking at Christmas and will enjoy having another delicious cookie recipe! Thanks Alanna! Chocolate chip cookies are always a favorite in our home. My husband enjoys molasses cookies and stepdaughter loves peanut butter cookies. The grandchildren love most anything sweet. Enjoy your newsletters and recipes, especially your originality and creativity. 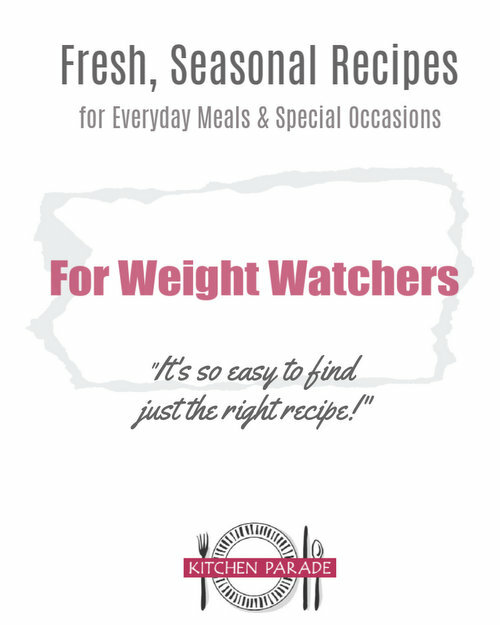 Thank you for the great information and tips and recipes you keep posting, and now a giveaway as well! I feel blessed. My favorite Christmas recipe is the family shortbread recipe. I always remember my Dad saying "Aunty Ellen's shortbread is the best I have ever tasted" My heart swelled with love for him when I overheard him saying some years later(OK after Aunty Ellen had died) "my daughters shortbread is the best I have ever tasted". I had the same problem with baking sheets. Last year I treated myself to six new identical half-sheet ones from a restaurant supply store. So nice to have nice big ones that perfectly fit my parchment sheets from KAF! Everything bakes up the same, and no waiting between batches for the pans to cool down. It wasn't THAT expensive and makes the whole process so much easier. My favorite Christmas/holiday cookie tradition is leaving pecan cookies and eggnog out for Santa. The cookie recipe comes from Martha Stewart and it tastes like pecan pie. My favorite Christmas/holiday cookie tradition is baking cookies with my son. My favorite Christmas cookie is lemon bars. Or maybe it's the frosted chocolate balls. No, the orange truffles. Or is it the Russian tea cake? Too little time and too many cookies. Really, though, my favorite confection to make is the pulled mints I learned from my mother who learned from my grandmother..
My favorite holiday traditions are watching Rudolph the Red Nosed Reindeer, How the Grinch Stole Christmas, and, on Christmas Eve, watching Bad Santa with a glass of wine! Always gets me in the mood to start cooking Christmas dinner for the relatives and friends! My favorite Christmas/holiday cookie tradition is ...baking cookies with my Dad. Unfortunately 10 years ago I moved all the way across the country from them so we haven't kept it up. Plus my Dad's been diabetic for the last several years which has put a crimp in our baking. So I decided to start a new tradition this year and bake diabetic-friendly cookies to send to my Dad, aunt, uncle and father-in-law (all of whom are also diabetics with a sweet tooth). I just finished 3 batches that will go in the mail tomorrow. Thanks so much for your tips and if you or your other readers have any great diabetic cookie recipes I'd love to add them to my now-growing collection. I'd love a copy of that book. My favorite Christmas/holiday cookie tradition is baking cinnamon/ginger cookies and having for breakfast the day after Christmas. My favorite Christmas/holiday cookie tradition is... to invite our friends over and bake gingerbread cookies all together. Everyone can bring their own cutters along, if they like. And later we all decorate them with iceing. Gingerbread cookie dough is usually made by traditional recipe. Thank you for your tips on cookies and also veggie tips. My favorite Christmas tradition is the baking exchange I have with my 3 sisters and my Mom. In December, we meet at one house & bring all our baking needs to make 2 desserts each but with enough ingredients to make 5 batches of the same recipe. For example, if I'm making a fudge, I need to make that same recipe 5 times so that everyone has a fudge to go home with. We end up with lots of desserts and we spend an afternoon, drinking wine and having a great time baking. My address is danicloutier at hotmail dot com. Keep up the good work, your blog is so interesting. My favorite holiday cookie tradition is the weekend before Christmas spent baking tons and tons of cookies for all of my family and friends! My favorite Christmas/holiday cookie tradition is baking cookies for my husband, kids, and especially my father-in-law. I have a chocolate chip cookie recipe that he calls "Jenny cookies" and he pouts if he doesn't get some, both at Christmas and every single time we visit throughout the year! My favorite Christmas/holiday cookie tradition is...my mother's springerles (which I haven't attempted yet), her coffee bourbon balls, chocolate drop cookies, coconut candies (just like Mounds, but better), and her peanut brittle. Recently I've been doing more candy than cookies for the holidays, but my mom's holiday goody assortment was always so much fun, and so yummy. I need to do more cookies! My favorite Christmas/holiday cookie tradition is making Christmas Eve dinner. We have a meal of exotic appetizers and it's just great fun. "My favorite Christmas/holiday cookie tradition is a cookie exchange with friends... so fun AND tasty!" My favorite Christmas/holiday cookie tradition is my boyfriend's mom's massive baking operation! This year she made over 300 dozen cookies for all her family and friend. My baking hero! My favorite Christmas/holiday cookie tradition is my boyfriend's mom's cooking backing operation. This year she made over 300 dozen cookies for her family and friends. My baking hero! ...Canada Bars, which my mom made only at Christmas time. Many years later I discovered from a Canadian friend that they're called Nanaimo bars there (it's a town name). Love your emails - the thoughts that you write - the humor - and the recipes.. Your tips are great! I do alot of holiday baking - definately going to try the powder sugar this year vs the flour when I get to the cut out ones - especially with the ones where my 2 little granddaughters who are 7 and 5. They love baking with grandma! Thanks for a chance to win. I'm at 68 doz so far and not quite half way thru my list! Merry Christmas! My email is lreiterman at gmail dot com. My favorite Christmas/holiday cookie tradition is our annual sugar cookie bake-and-decorate party. Growing up, we did this every year with family friends who lived a bit distant. It was a fun way for us kids to play, catch up and sneak loads of frosting. I can't wait to pass the same tradition to my own children. My favorite Christmas/holiday cookie tradition is to bake a box of cookies for my husband's boss and co-workers- they seem to love it year after year! My favorite cookie is probably World Peace Cookies by Dorie Greenspan- soooo good. "My favorite Christmas/holiday cookie tradition is ... ."
My sister, her daughter and I continually re-email Mom's/grandma's almond crescent recipe to each other. It is a very fragile cookie that requires the baker to do a lot of taste testing. My favorite Christmas/holiday cookie tradition is making my grandmothers roll-out sugar cookies. Our family calls them turkey cookies, because she always made turkey-shaped ones at Thanksgiving. She also made them in the shape of Texas with Red Hots marking the cities where everyone lived. My favorite Christmas/holiday cookie tradition is exchanging cookies with friends! My favorite Christmas/holiday cookie tradition is eating the cookies that my daughter makes. She's a great cookie baker.